Social networking giant, Facebook introduced new voice messages and chat feature to its messenger app. 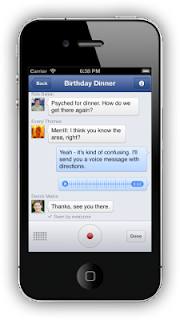 Facebook messenger is a standalone app that enables the users to see and respond to your chats right from their desktop. Adding this new feature will help the users to record and send messages to the intended recipients. How to Send a Voice Message? 1- Tap the + sign. 3- Lift your finger when you finish recording and your message will be sent automatically. The recorded message can of of 60 seconds long. Facebook users in Canada will get the facility to make free voice calls by tapping the "i" button in the top right corner and then hitting "Free Call". Thanks for helping me on this issue I was searching for some App for my android for making voice call and messaging free. I was using Facebook messager but was not aware of its update. After searching on many sites finally I got the clear description here. I visited on other site where they had explained about this topic, but was not too clear and I had to move for other site. And now see, I got everything clear from you by picking every fact & simple steps for updation. Will come back to you soon for more updations, Keep updating.